Giant pandas, as one of the world's most iconic animals, can always create a sensation. So getting to be the one who looks after the black and white stars, especially when they are babies, can land one in the limelight too. 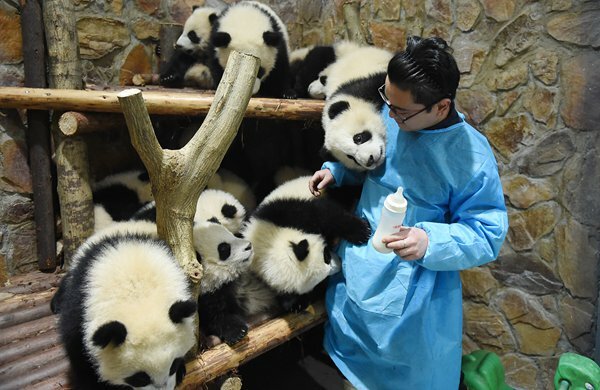 Zhang Yue, a keeper at the Chengdu Research Base of Giant Panda Breeding, Southwest China's Sichuan Province, has recently become an Internet celebrity after a video showing him feeding eight baby bears went viral in November last year, racking up 30 million views within a month. He is now regularly asked to pose for pictures by panda fans. Zhang, 27, grew up in Chengdu and got a job at the base in 2012 after majoring in veterinary sciences. "A job where I get to feed national treasures every day was extremely attractive," he said, according to a People's Daily report last October. But the job is not as easy as people imagine. 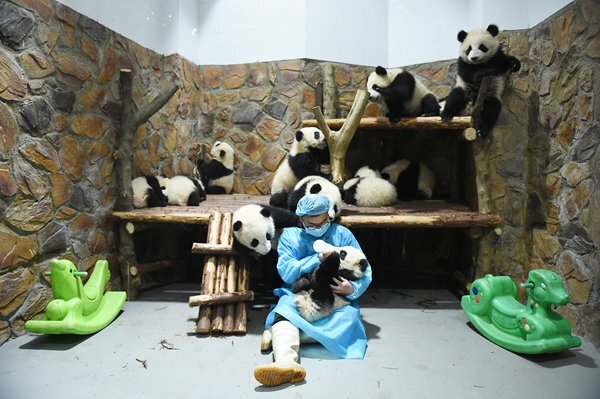 Each of the base's 80 keepers is normally in charge of two adult pandas. But at busy times Zhang has had to care for five adult bears and nine babies at once. Sometimes he has to stay in the base all day, as newborn pandas require round-the-clock care. "When a couple is in heat, we are even more nervous than they are and get up every two hours to observe them," he said. 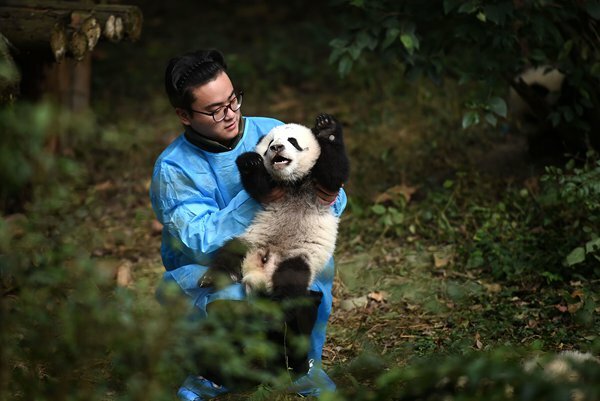 While he cares for each baby panda as if it was his own child, he confesses that his relationship with the animals is inevitably only short-term as they will eventually be sent somewhere else when they become adults. "Years later, they might no longer recognize me, and neither will I recognize them." He recalled a panda called Damao with whom he spent two months, both day and night, while the bear was in quarantine before it was sent to a zoo in Canada in 2012. "In 2015, a friend of mine went to the zoo and we had a video call. When I called out 'Damao,' it looked at me. 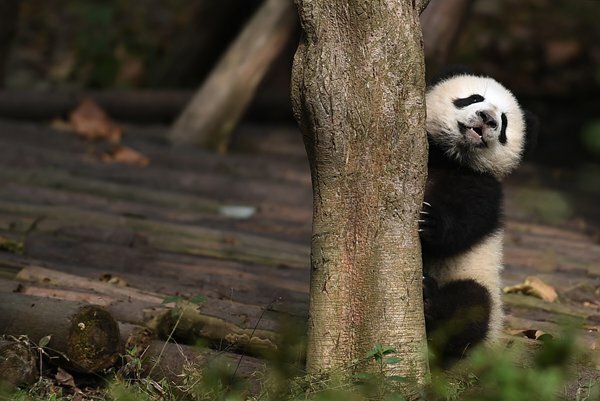 I think it still has a little memory of my voice," he was quoted as saying by ipanda.com, a website that enables panda fans worldwide to watch live round-the-clock broadcasts of the bears in the Chengdu base.